At Morris Mechanical, we strive to understand the nature of your business. If your air conditioning system or heat is out, you can’t effectively deliver your product or service. That’s where we can be a real “tool in your toolbox”. Someone you can call on, with short notice, who will come quickly and take care of the problem the first time. We offer emergency service 24 hours a day and 7 days a week. We can come early, late or whatever it takes to keep you and your patrons happy. We understand your need to control costs. That’s why we offer Planned Service. Planned Service uses the old prescription of "an ounce of prevention". We can routinely service your equipment for a fixed price to keep the equipment in top working order. Businesses and churches alike find our Planned Service Programs useful in eliminating expensive downtime, keeping people areas comfortable, and reducing energy costs. You Cannot Afford to Lose Production Because of A Chiller or Cooling Tower! Developing a good working relationship with your mechanical contractor is one of the best assets a production company can have. You need a quick response, 24 hours a day, from a contractor who will send competent and certified technicians. If you don’t have that level of support established with your current HVAC service contractor, then don’t wait another day. As part of our qualifying process, we will survey your equipment and your manufacturing process to know up-front what issues are important to you. We create an HVAC equipment map of your facility. Every technician on staff will get it. We don’t waste your time wandering around your facility looking for a thermostat or an air handler. We can offer you estimated life expectancies of your existing equipment and help you plan the future capital expense budget. Many of our technicians have earned the NC Board of Examiners H3, H2 and H1 licensing. This means that you will be serviced by professional mechanical technicians and not students. You can expect veteran technicians who understand quality work and what taking care of the customer really means. We are also licensed in Electrical and Boiler Installation. Let us show you the Morris Mechanical difference! 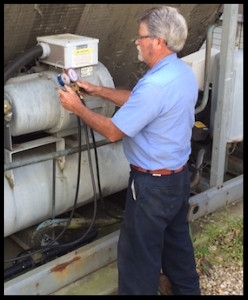 Morris Mechanical will help you resolve existing problems with air flow balance, temperature spikes, pneumatic controls, and any other applications that require specific knowledge and experience. Call us today for a free survey of your facility!